UFC History Project: UFC 63: Are You Impressed? “The Young Assassin” Melvin Guillard punched Gabe Ruediger in the body, and that was enough to stop him by TKO in the Round 2. 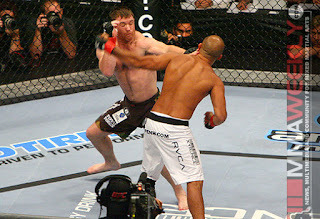 Rashad “Suga” Evans knocked out Jason Lambert in the second round. ; and Joe Lauzon won his Octagon debut over Jens “Lil Evil” Pulver by TKO in 48 seconds. Roger Huerta, who would appear on the cover of Sports Illustrated one year later, also won his UFC debut over Jason Dent by unanimous decision. In other preliminary bouts, Eddie Sanchez knocked out Mario Neto early in Round 2; Jorge Gurgel won a split decision over Danny Abbadi; and Tyson Griffin beat David Lee with a rear naked choke in 1:50.